Background Pneumonia is a leading cause of hospital admission. With mortality exceeding 18% (BTS CAP Audit 2013) the search for strategies to reduce this continues. Statins are receiving increasing attention for a potential role in improving survival from acute bacterial infections. MHRA guidance recommends that statins should be paused during treatment with a macrolide due to risk of myopathy and rhabdomyolysis. We undertook a retrospective study to determine the frequency of concurrent statin and macrolide administration in patients diagnosed with pneumonia and whether concurrent use of a statin and macrolide antibiotic to treat pneumonia improved survival compared to stopping statin treatment, and whether concurrent use was safe and tolerable. 165 patient episodes were identified by searching for patients who were coded as having pneumonia and were prescribed a statin and macrolide. Data was collected on statin, dose, severity of pneumonia including intensive care admission, comorbidities, survival, renal and liver function. Results 62% of the cohort continued a statin throughout pneumonia treatment. In the continued statin group survival to hospital discharge was 79% versus 64% in the group in whom the statin was paused (p = 0.034). Severity of pneumonia (CURB score) was similar for both groups. 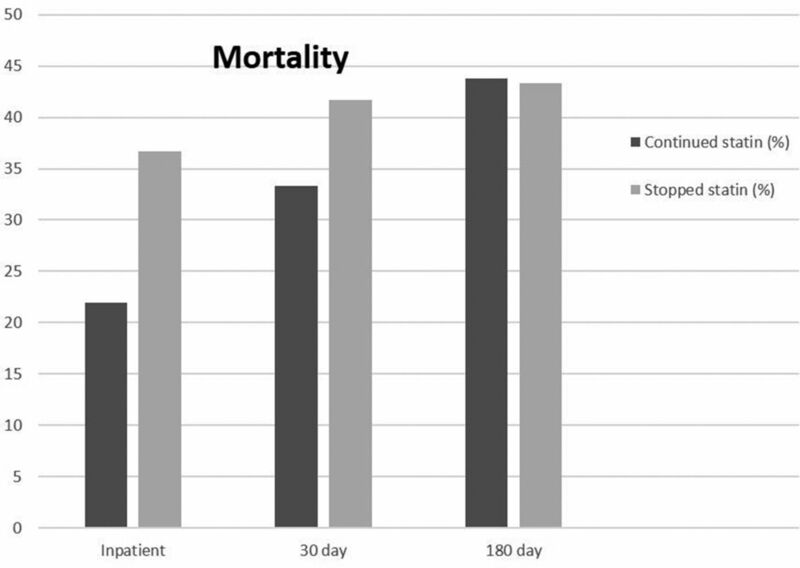 Statin users were less likely to be admitted to intensive care (28% vs 46%, p = 0.0219). Charlson comorbidity index score was similar for the statin (6.4, IQR = 5–8) and non-statin (6.1, IQR = 5–8) groups. There was no increased risk of acute liver, kidney injury or myopathy in the continued statin group. Conclusion Continued statin use during treatment for pneumonia with a macrolide antibiotic is safe and may improve survival compared to stopping statin use. Current guidance on concurrent use of statins and macrolides should be reviewed.